Loyal fans of Duke will be getting fresh content this fall. Today Gearbox Soft announced that the "Hails to the Icon Parody Pack" for Duke Nukem Forever will arrive on October 11th on the PS3, Xbox 360 and PC. The DLC includes four new maps and three modes as well as a smattering of new weapons. The DLC will be available for no charge to First Access members who registered before DNF's launch earlier this year. Everyone else will have to pay $9.99, or 800 MS Points. 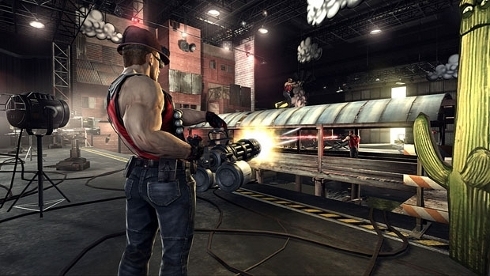 Call of Duke – "Duke engages in modern combat in a war-torn city. Foes don’t stand a chance against the Duke when he spams the map with the N00b T00b." Sandbox – "Players take the role of mini-Duke in a giant sandbox with two bases at either end made out of children’s toys. This map features Sticky Bombs." Inferno – "Time machine engage! Duke does combat in a hellish landscape of lava and teleporters. Who turned on the 16-bit graphics, and more importantly, where did this DFG come from?" 2Forts1Bridge – "Hats? Duke doesn’t need no stinking hats. Give him a minigun and he’ll beat off all comers." The new "Hail to the King" mode is your standard free-for-all. "Freeze Tag" mode challenges you to freeze and then shatter your opponents. You'll get more points by pulling off several shatters in a row. 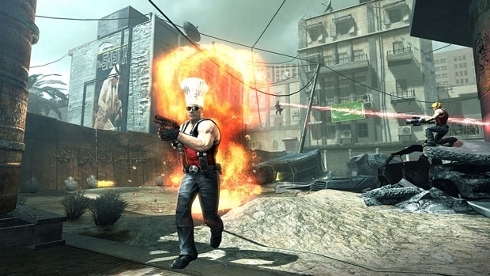 The third mode, "Hot Potato," players earn points by holding onto a babe longer than their opponents.